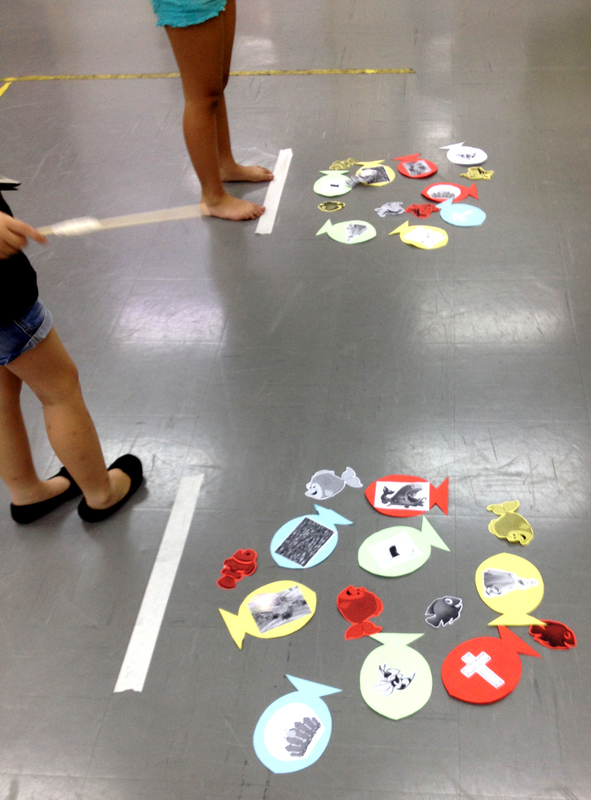 Fishing Game: Divide the children into 2 teams and ask for volunteers to represent the team. 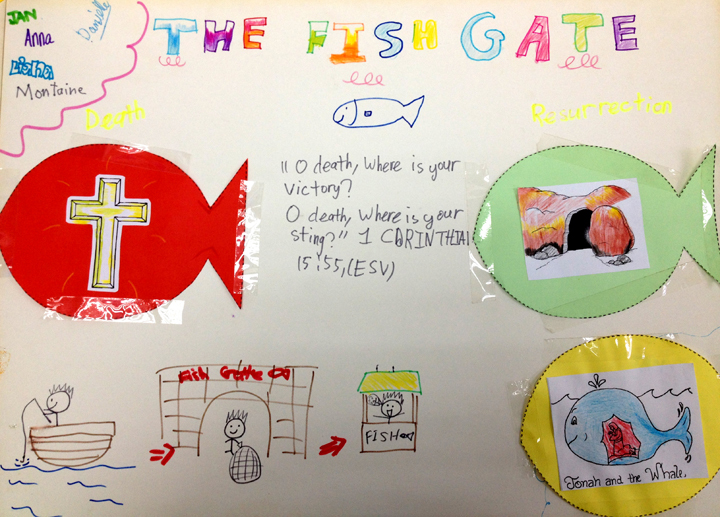 To prepare the game, cut out fish-shaped paper with drawings of the following: wall, sheep gate, fish gate, Jonah in the fish’s stomach, cross, sting, empty tomb, Cinderella. Attach each picture with a paper clip. Make a fishing rod by attaching a magnet to a string and then attach the string to a stick. Each representative will “pick one item” and pass the rod to the next person. First team to finish wins. Collect the items. Pick up each item (see the words in bold and enlarged font below) according to the following sequence and tell the story. As you heard in the previous lessons, Nehemiah got the people of Israel together to rebuild the wall. There were 42 groups of people working on specific areas of the wall. They were priests, leaders, craftsmen, Jews from other cities. Different groups worked on different portions of the wall. There were 10 gates mentioned in the rebuilding of the walls. Last week, we covered the sheep gate. Anyone remembers why was it called the sheep gate? It was called the Sheep Gate because it was the entrance for sheep entering into the Temple compound from the sheep markets (where lambs were sold for sacrifice in the Temple) and the sheep pool (later known as Pool of Bethesda), where sheep were washed for sacrificing. 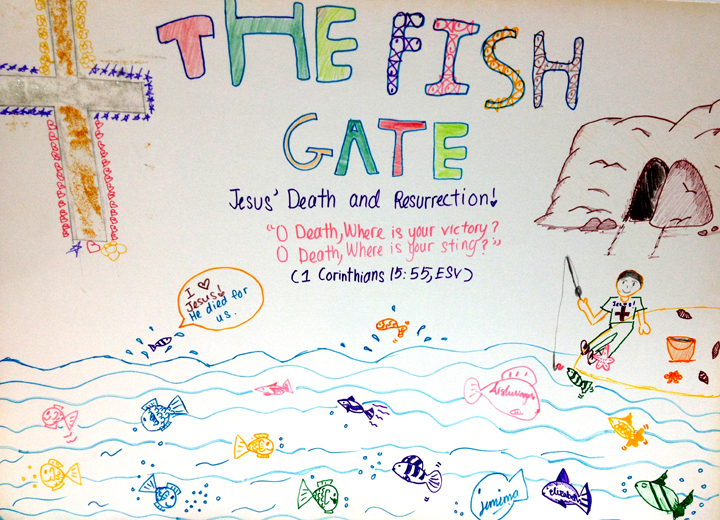 Today we are going to talk about the Fish Gate. The Fish Gate was the second gate to be restored, and it was rebuilt by the sons of Hassenaah. “Hassenaah” means the thorny, the pricky (sting). 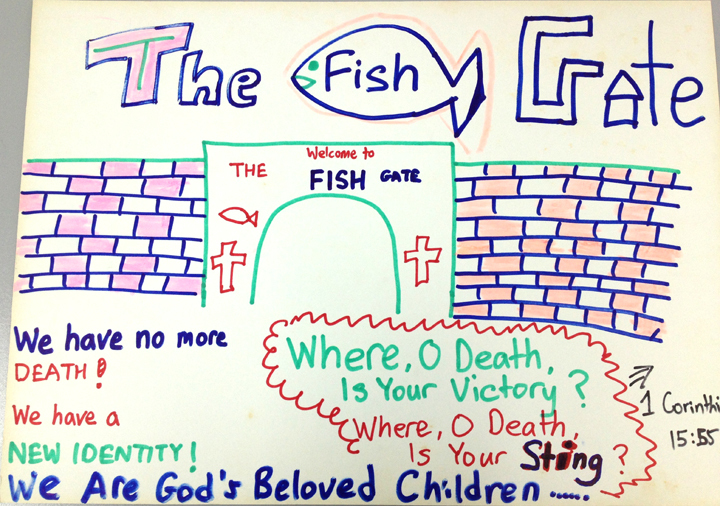 It was called the Fish Gate because the fishermen of Galilee will bring their catch through this gate to be sold. What does the Fish Gate remind us of? In Matthew 12:40, Jesus had told the people that, “For as Jonah was three days and three nights in the belly of the great fish, so will the Son of Man be three days and three nights in the heart of the earth”. Jesus said this even before he was arrested and died on the cross for us. (Book of Jonah) Jonah was a prophet who ran away from God because he did not want to go and tell the people of Nineveh to repent and turn to God. He hated the people of Nineveh and wanted God to punish them. But God prepared a fish to swallow Jonah and he was in the fish’s belly for 3 days and 3 nights. 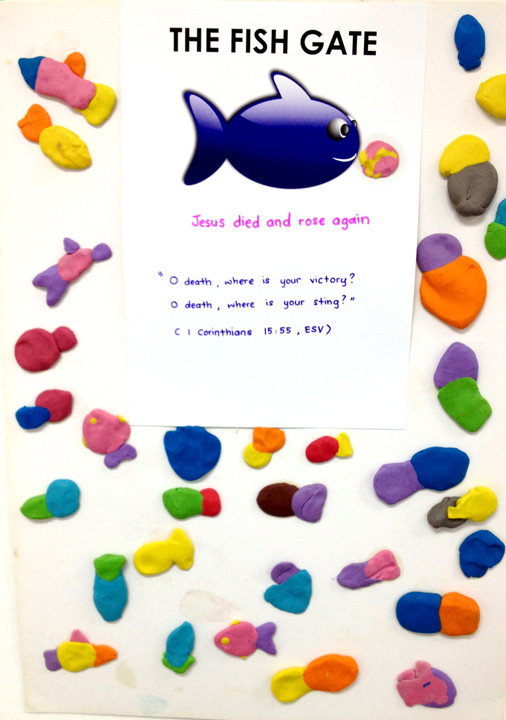 When Jonah prayed to God, the fish vomited him on dry land. Jonah finally went and told the people of Nineveh to turn to God, which they did and were saved from destruction. Jonah’s story is one of God’s grace — the people of Nineveh did great evil and deserved to be punished; but our ever-forgiving, ever-loving God wanted them to come to Him and be saved. Do you know what people fear most? Death. Why? Because people want to live. They also don’t know what will happen to them when they die. When Jesus died on the cross, he saved us from the death. “For God so loved the world that he gave his one and only Son, that whoever believes in him shall not perish (die) but have eternal life”. (John 3:16) We no longer need to fear death because we know that we have eternal life. If we were to die today, we will go to heaven to be with Jesus forever. Like Paul, we can even say “O death, where is thy sting? O grave, where is thy victory?” (1 Cor 15:55) which is in fact saying that death cannot hurt us because Jesus has won over death as he rose from the dead and is alive forevermore. (empty tomb). How many know the story of Cinderella? What was she when the story started? She was an orphan, treated like a house maid by her step-mother and step-sisters. Her real name was Ella, but since one day she became so dirty, covered with cinders after falling asleep by the fireplace, her step sisters started calling her “Cinder- Ella”. What was Cinderella when the story ended? She became a princess and lived in the palace because she married the prince. She did not have to slave away in the ashes anymore. Like Cinderella, our identity was also changed. We were sinners and were separated from God. When Jesus died on the cross, he took away our old identity as sinners and gave us a new identity as God’s beloved children. Jesus took away all our sins past, present and future. When we accept Jesus as our Saviour, we are in Christ. We are as the Bible says in 2 Corinthians 5:17, “Therefore, if anyone is in Christ, the new creation has come: The old has gone, the new is here!” We are righteous and we will always be righteous even if we mess up and sin because we are in Jesus, who is righteous and will always be righteous.